If you are a homeowner, who has basic tools and knows how to use them, and wants to save on installation, you probably can install laminate or any other type of floating floor by yourself. 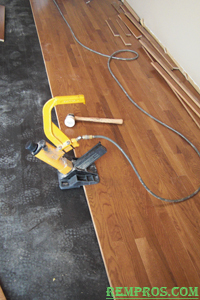 It is a little bit more complications with any engineered or solid prefinished hardwood floor. If you do not have any experience or at least saw how installers do it at a job site, you might have to spend extra time figuring out this by yourself or looking online for help. Plus you have to buy, or at least rent, additional tools. When it comes to solid unfinished hardwood floor it is much more complicated. You might be able to install and even apply finish on the wood, but without any experience it is almost impossible to make sanding right and nicely done. Prior to installation of any type of hardwood floor the area of installation has to be detail inspected for moisture, squeaks or any other impacts and damages. Sometimes it is necessary to fix cracks in the concrete or screw plywood to joists on the subfloor in order to eliminate noisy squeaks. Moisture can cause a big problem to hardwood floor. Never install any type of wood flooring materials before measuring subfloor moisture, especially in the areas where it can be potentially higher than normal. Sometimes installation of moisture barrier is necessary. The subfloor should be flat. It is very common that before hardwood installation in older houses preparation process might take more time and add price to the labor cost. Do not install hardwood right after delivery. Let it stay for 5-7 days with a normal temperature in the place where it will be installed. When preparation process is done it is good to remember that it is always better to select best looking boards without any defects and install them in the most visible places. It is especially important for the prefinished hardwood floor. After selection choose the direction in which hardwood floor will be installed. It depends on many factors such as shapes of the rooms, entrance place, presence of the stairs and other. Usually, for the best visual effect, it is recommended to lay hardwood parallel to the longest wall. But, for the some kind of fancy and unusual look, it is definitely a possibility to go with any other pattern. Learn how to staple down solid hardwood floor.